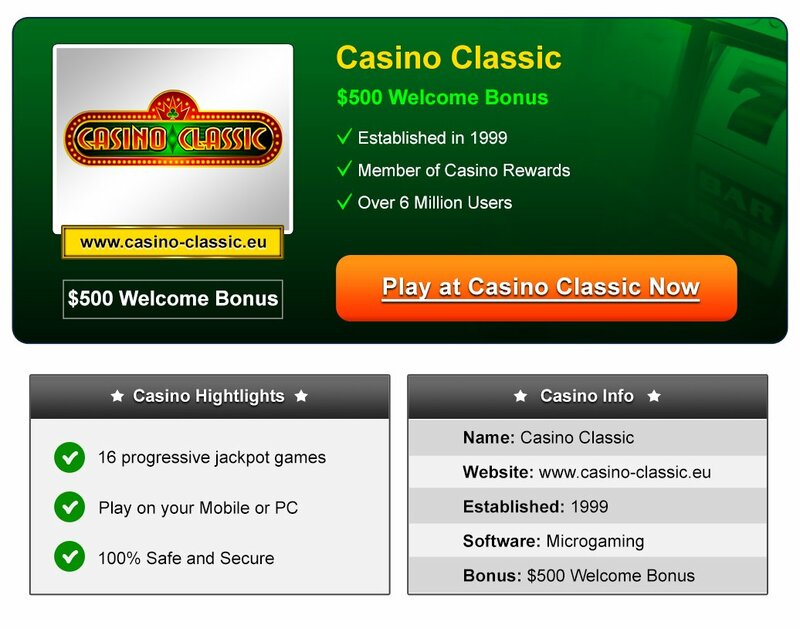 Powered by Microgaming and a part of the Casino Rewards Group, Casino Classic has an old-school feel to it. Originally established in 1999, they are one of the longest serving online casinos running, and cater to millions of players all around the globe. Since Casino Classic is a Microgaming casino, you will find more than 500 casino games available to play here. Anyone that knows online casinos will know that games made by Microgaming are widely considered to be the best available. So having a selection of over 500 to choose from will satisfy anyone that likes a wide range of games to choose from. Although the video slots make up a majority of the games, we found a wide variety of table games including several variants of blackjack and roulette. We thought this was clever, as there are some significant differences in these games depending on where in the world you play them, and Casino Classic offer all types to cater to as wider range of players as possible. We also came across Baccarat, Sic Bo and Cyberstud Poker. Casino Classic also has a plethora of Video Poker games too, like Jackpot Deuces and Jacks or Better. So, basically there’s something there for everyone to play here. 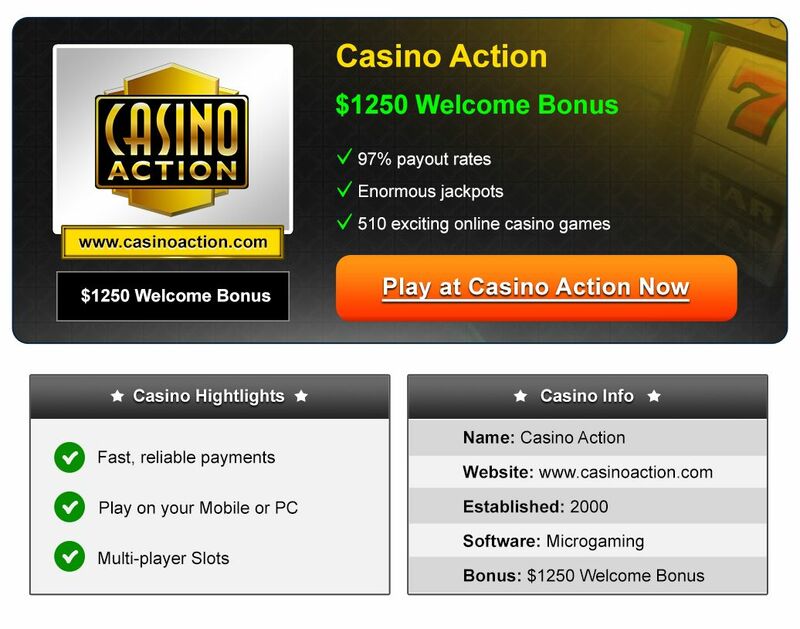 The Welcome Bonus that Casino Classic offers actually varies depending on whether you are playing on a desktop computer or a mobile device. If you are playing on a desktop computer, then you will receive £€$500 in casino money, and you will have 60 minutes in which you can play this money. You can keep any winnings you make with this free money, but as with all casinos there are play through terms in place before you can cash out your winnings. Casino Classic has 16 progressive jackpot games like Major Millions, Cash Splash, Tunzamunni, Lots a Loot, Fruit Fiesta and of course, the biggest online progressive jackpot game, Mega Moolah. The minimum amount the Mega Moolah jackpot goes down to is £€$1,000,000, but it is regularly up in the multi-million range. We found that the customer support at Casino Classic were very knowledgeable and efficient. We were able to contact them quickly and easily via their live chat. We asked them how they cater for players in countries around the world, and they said they have support available in all of the languages they offer their casinos in. Other options like a toll-free number and email are also available if you prefer to use these methods of communication. With an amazing selection of games, an eCogra Seal of Approval, and the fact that it is available for both desktop and mobile players, we feel that Casino Classic is a very good online casino for players of all levels. A red carpet, an elegantly dressed doorman welcoming players, and a chance to claim $700 free! It really can’t get any more extravagant than this. A British-themed online casino, the UK Casino Club has a regal air about it. It is a member of the Casino Rewards Group, and we received Royal treatment from the get-go. We must say that it was a very pleasant surprise how positive the experience was, right from the moment we signed up here. Established in 2000, there is certainly no doubting their experience and knowledge within this busy market place. They know exactly what makes their players happy and they over-delivered on that from our experience with them. Since it’s accredited and licensed by the Kahnawake Gaming Commission, and also carries the eCogra Safe & Fair seal of Trust, you can be sure that UK Casino Club is a trustworthy and reputable brand. 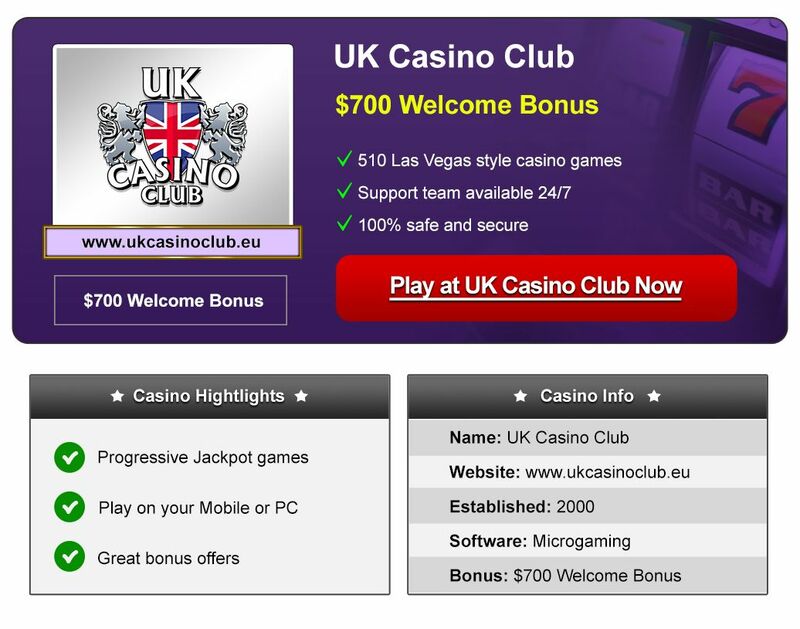 The UK Casino Club is a Microgaming-powered casino. And you can expect in excess of 500 casino games. From video slots, table games to poker games, we were literally bombarded with various choices in each type of casino games. However, we found that there are more slot games than table or poker games. Another great thing about the UK Casino Club is their sign up bonus. They offer a five-tiered match bonus on your first five deposits. On your first deposit, you can receive a 100% match bonus up to $100. This effectively means that you stand a chance of claiming up to $700 in free bonuses! The UK Casino Club’s mobile casino enables players play their favorite games anywhere and at any time on their mobile devices. Like the online version, the mobile casino also exudes style and opulence. The mobile casino is available to all players that own iOS, Android or Windows phones. We found that the mobile version also carries the same $700 Welcome bonus as the desktop version.